Enjoy the peaceful atmosphere that surrounds the lounge area at the Rifflin'Hitch Lodge in Southern Labrador in Newfoundland Labrador, Canada after a day of fishing. A great place in the lodge to relax by the fire enjoying a beverage and the scenic view through the large glass windows. 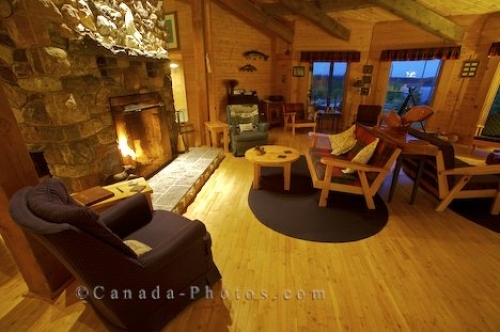 Picture of the elegant lounge area at the Rifflin'Hitch Lodge in Southern Labrador in Newfoundland Labrador.